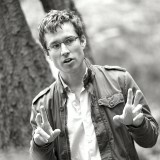 Timon McPhearson, New York. Victoria Marshall, Singapore. Small-scale urban spaces can be rich in biodiversity, contribute important ecological benefits for human mental and physical health (McPhearson et al., 2013), and overall help to create more livable cities. Micro_urban spaces are the sandwich spaces between buildings, rooftops, walls, curbs, sidewalk cracks, and other small-scale urban spaces that exist in the fissures between linear infrastructure (e.g. roads, bridges, tunnels, rail lines) and our three dimensional gridded cities. But most of these micro_urban spaces are overlooked, unrecognized, and even invisible parts of our urban lives. Perhaps our inattention to these spaces is because they so often exist in between our more highly valued built spaces such as large parks, plazas, waterfront promenades, urban forests, rivers and much loved neighborhoods. One of the great biodiversity challenges for urban ecosystems is to solve the problem of high levels of habitat fragmentation in cities. What if the micro_urban were the missing piece to solving the connectivity puzzle in our fragmented urban ecologies? An example of a durational micro-space titled “Permeable Futures” by students from the Temporary Works class in the BS urban Design and BFA Integrated Design program at Parsons the New School for Design, taught by Adam Brent. Credit: Sophia Jose, Josh Snow, Eliot Benis, Kayla Paeglis, David Braha, Ashley Padget. These elements and experiences remain underutilized in ecological urban design practice yet are a ubiquitous feature of our urban infrastructure. Even low-level investment in these micro-spaces could provide new grounds for ecosystems to establish, for urban dwellers to socialize, and contribute to both well-being and community resilience to the many dynamic changes affecting social-ecological attributes of our urban lives. One of the critical biodiversity challenges in cities is dealing high levels of habitat fragmentation. Creating corridors between fragmented green patches in highly heterogeneous landscapes is difficult in older cities with dense built and technological infrastructure. And yet cities have immense potential for linking urban parks, wild spaces, and small green patches through green roofs, green roadways, and other corridor infrastructure that could provide species greater ability to move and migrate while increasing more equitable spread of ecological space throughout cities. Micro_urban takes this idea further. Rather than a corridor approach that links already existing big green fragments we have been talking about how micro-spaces in any neighborhood with or without parks and with or without corridors could be networked or clustered to provide a networked ecology in cities. By seeing green roofs, green walls, sandwich spaces between buildings, and durational spaces together we have begun to imagine how people in cities could beginning greening well beyond new parks or retrofitted railways. 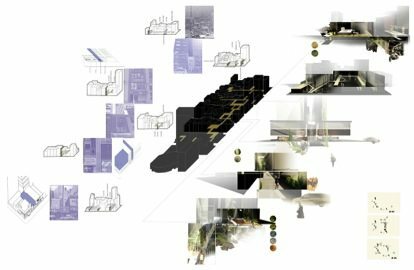 How might micro_urban habitats that are networked throughout the city; up, over, around, and through our built and social infrastructure then make a difference in the social and ecological well-being of a city? Recently, at the invitation of Mary Miss, we developed a guided walk for the City as Living Lab (CaLL) project. We took participants on a tour through the Garment District in New York and we asked them to recognize the potential for these micro_urban spaces to make a difference in the lives of both human and non-human species. 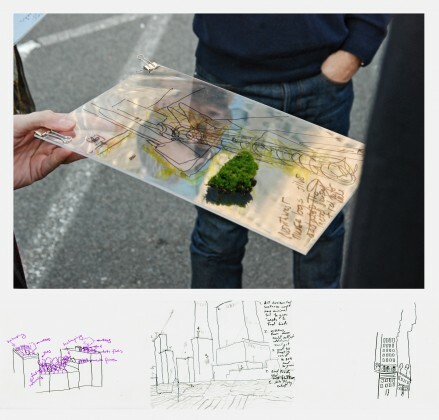 We then went to the roof of the Port Authority Bus Terminal parking lot and through a simple drawing exercise we let each participant’s own desires and goals drive their own ideas of the micro_urban. CaLL walk participants meeting at the corner of 39th and Broadway in New York. CaLL. 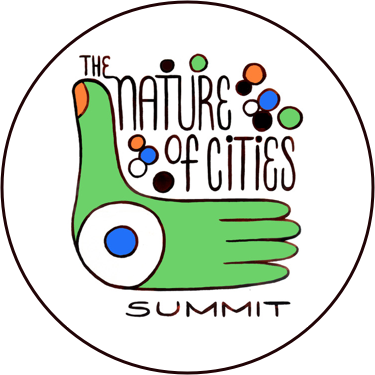 is an initiative spearheaded by artist Mary Miss to establish a platform for artists, working in collaboration with scientists, urban planners, policy makers, and the public, to make sustainability tangible through the arts. CaLL asks: by what means can we foster roles for artists and designers to shape and bring attention to the pressing environmental issues of our times? We took our inspiration for both the location in the Garment District and a way to focus our ideas on micro_urban from ongoing micro_urban research on Fourteenth Street in lower Manhattan (see references at the end of this essay) and from a visiting Parsons School for Design student, Yanisa Chumpolphaisal, a 2013 Graduate from Chulalongkorn University in Bangkok and a visiting student in the Parsons BS Urban Design program. She created a project titled “The Art of Capital” where she mapped the billboard corners, sandwich spaces, and the landscape of setback roof spaces in the Garment District. The colors on the map can be read as follows: Light Blue – billboard corners, Dark Blue – sandwich spaces. Numbers mark the height of the buildings. Yellow border is the historic district where many setback roof spaces are found – a response to the 1911 zoning code that set building height and bulk limits in order to provided for light and air in the street canyon – creating a ‘wedding cake’ urban form. Credit: Yanisa Chumpolphaisal. This map served as the launching point for the CaLL Walk we developed. As you can see from Yanisa’s drawings, once you start to look for these small overlooked, underutilized spaces you find that they are evenly scattered throughout the city, by accident, by design, and by history; nearly everywhere in this area. Yanisa’s familiarity with soi (small alleys in Bangkok) helped her imagine this area with new eyes Her images reveal how she started imagining what could be done with these spaces. How they could have positive impacts on the lives of local residents if they were reimagined as ecological and social space, and be an opportunity for improving the Garment District as a support system for artists. Yanisa expanded on the way urban residents in Thailand and New York take advantage of every opportunity for socializing, and for small business. 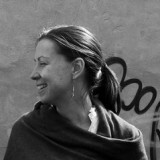 From this she drew possibilities between the social life and micro-spaces in the Garment District in New York. Right now those billboard corners, sandwich spaces, and setbacks are virtually bare of anything living. Indeed, the more you look you begin to realize that the unmet potential is vast. One of the main thrusts of urban ecological research and practice is to understand how ecological spaces can be co-designed, managed, and engaged in ways that improve the lives of both human and non-human species. These micro-spaces are opportunities and the locus for focusing the imagination of the artists, designers, and scientists who joined us on our CaLL walk. 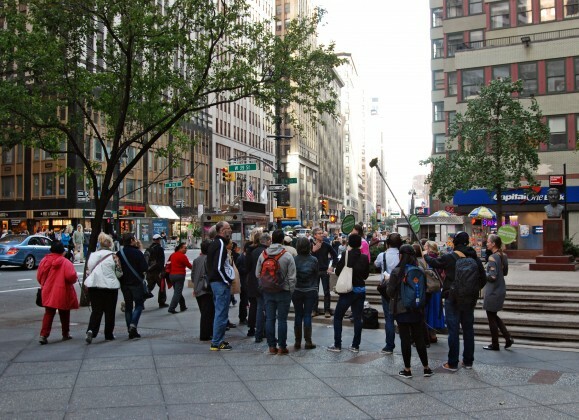 On October 25th 2014 we gathered a group of urban ecology enthusiasts on the corner of Broadway and 39th Street in New York City and walked up to and along West 40th street toward the Port Authority Bus Terminal, observing the sheer number and possibility of the micro_urban. We motivated our group in two ways. 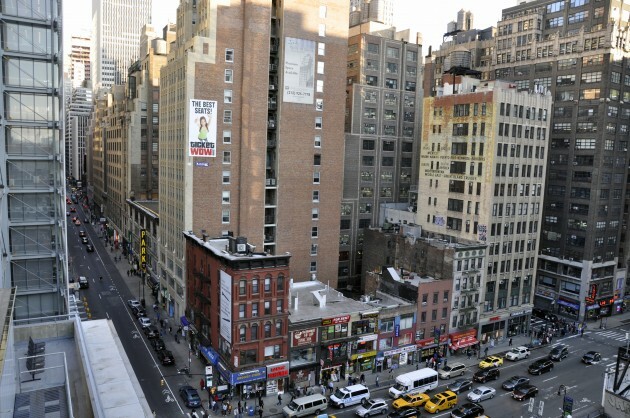 First, we focused on three urban forms: the sandwich, the billboard corner and the setback. 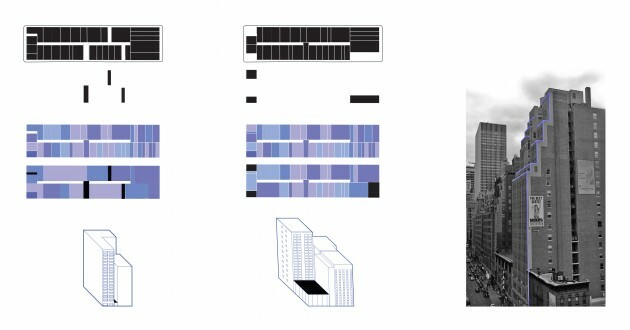 Second, we observed social-ecological interactions and spaces to imagine a networked ecology of the micro_urban. In our walk, we first, observe these spaces, and second imagined the opportunities that exist over the space of just a couple blocks. Ecologically, the fundamental idea is that soil, microbes, plants, invertebrates, birds, and other urban adapted organisms can exist in spaces we don’t traditional consider as ecological habitat. What if building owners, their tenants, the business improvement district and other urban actors intentionally managed these spaces to foster more diverse and healthy ecosystems? How might active engagement with the micro_urban help solve the connectivity puzzle in our fragmented urban ecologies? 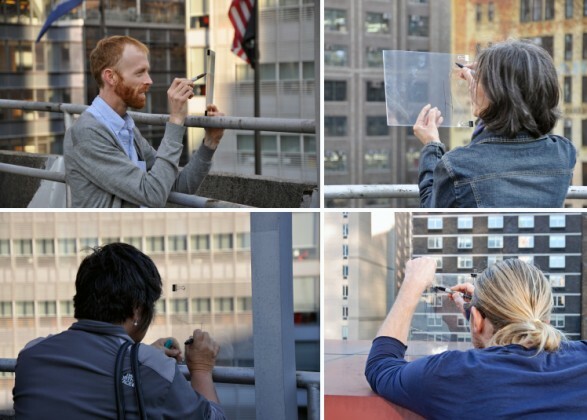 Eventually we took our walk to the roof of the Port Authority, seven stories up, where we conducted a drawing exercise to allow each person to reimagine how these spaces could be used to change the Garment District. Everyone was given simple tools and a method of tracing (acetate on clear plexiglass and markers, developed by Jose DeJesus). We asked participants to use their imagination to draw how these three kinds of spaces, the sandwich, the billboard corner and the setback, might become more biodiverse. In simple terms, we asked them to look out, and look up, and to draw soil as a starting point for urban ecological change. Our own goal in this project was very simple: to convey an understanding of the unique urban form of the area, to explore the potential of unused surfaces to become biodiverse. We were also interested in the value and sociability of those spaces as ‘borrowed and collective views’ rather than gardens directly inhabited by humans. This more complex level—inclusive of insect diversity, microbe diversity, pollinator diversity—engages how these diversities might also begin to create new social spaces in a neighborhood undergoing rapid and dynamic change. It is at this point that were able to introduce the idea of people as part of green infrastructure—as a support system for biodiversity. Our group was already highly engaged in thinking about important ecological problems in micro_urban spaces. For example: Could mirrors be employed to move sunlight into otherwise dark spaces? How might vegetation be encourage on vertical surfaces through creative use of novel growing substrates? Why is there moss here? How can water move differently on those surfaces? Who might build this? How might they work together? And so on. Everyone chose a different scene to draw—some went to the far end of the roof, some drew the roof, and many drew the area we had just walked. Then we asked people to share what they had drawn. As members of the Walk presented their ideas at the end of the hour we were struck by how many different ideas there were, the sheer diversity and creativity, and overall how much is truly possible once you start seeing social-ecological opportunity in the micro_urban. Credit: CaLL Finished drawings. Ideas included nurse logs, beekeeping, growing food for restaurants, ‘weeds’ to feed birds, kite flying contests, and extensive mini-ledge gardens. Often roof gardens are designed in a very high-tech way with many pleasurable amenities for people that increase the value of a property, such as chairs, colorful flowering plants and grasses, kitchen gardens, dining areas, and even swimming pools. We offered our CaLL walkers a more simple approach. What if it is OK that people can’t go on the roof? What if only soil was added, after which plants, insects, birds and other species colonized these spaces naturally. They may already be there—seeds move with the wind, and with birds that are flying around searching for places to perch. McGrath and Pickett (2013) describe a nested mosaic framework as a metacity approach to modeling cities. They engage the term meta not as bigness but as a spatially extensive ‘system of systems’. Through the walk, the drawing exercise, the discussion, and our reflection on this experience we found that a soil-based imagination to this high density neighborhood afforded a metacity spatial understanding for action that could increase biodiversity, create a shared sociability for deeper engagement with natural processes in our cities, and greater well being through neighborly interaction above, and in addition to, crowded and contested sidewalks. Our earthy micro_urban approach to the garment district was informed by the urban heterogeneity of this Manhattan neighborhood. It was also informed by walking as a base for engaging people as part of green infrastructure. There are other types of movement. For example, consider the difference in the sociability of the stroll, promenade, ramble, commute, parade, ceremony, game, festival, or protest. Each is a type of social space where action in relation to and with ecological spaces might be engaged with intention. What micro_urban approach does your neighborhood afford? McPhearson, Timon, Peleg Kremer, and Zoé Hamstead. 2013. “Mapping Ecosystem Services in New York City: Applying a Social-Ecological Approach in Urban Vacant Land.” Ecosystem Services (2013): 11-26. Victoria Marshall, “Designing Patchy Microclimates,” in Scapes 8: Triggers: Urban Design at the Small Scale, eds. Joanna Merwood Salisbury and Brian McGrath (CreateSpace: New York, 2013). Victoria Marshall, “Street Life,” in Art in Odd Places: Ritual, ed. Ed Woodham (Art in Odd Places: New York, 2013). Victoria Marshall, “Self-Centered Ecosystem Services,” Scapegoat, Issue 01 (2012). The Ecology of the Metacity: Shaping the Dynamic, Patchy, Networked, and Adaptive Cities of the Future: S. T. A. Pickett, B. McGrath, M. L. Cadenasso, in Resilience in ecology and urban design: linking theory and practice for sustainable cities, S. T. A. Pickett, M. L. Cadenasso, B. McGrath, Eds. (Springer, New York, 2013), pp. 463-489. The crux of this entire article is predicated on the idea that every social space has to have a purpose. There are supporters and naysayers to utilizing the urban landscape to its fullest potential. 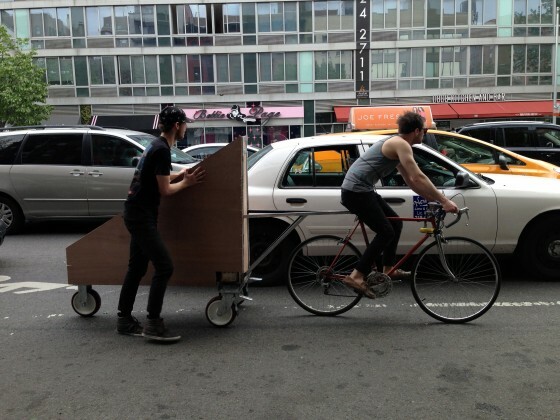 While I am firmly in agreement with channeling micro urban spaces as ecological networks that are connected to every aspect of the urban environment, the ability to carry it out correctly is an issue. it’s not necessarily an issue for me, but for others it can be. The best way to ingratiate the health of our planet as well as the health of the people and animals living on it is to have environmental justice in mind. Everyone has a right to have access to a healthy lifestyle or at least benefit from a safe environment. One that we all hope is a healthy for the sake of the planet, not just us. Educating and informing the public on how some of our lifestyle choices can be destructive is a number one concern. Only then, with an informed public can we move towards sustainable lifestyles that are still fun and efficient. Geographically speaking, New York is a prime destination for “Greenscaping” since it’s so clustered with buildings and littered with human-induced pollution. Changing these sandwich spaces, billboard walls, and roofs to mini gardens or homes for animals is beautiful. Trees planted can provide shade and oxygen for us, as well as a home for animals. Some of these animals, birds for example may be able to minimize certain rodent issues that New York might have. I believe there are more benefits to utilizing these micro urban spaces for socio-ecological purposes than there are drawbacks. Urban environments are incomplete without green spaces that help sustain them. This idea is one of the more creative I have heard. Having said that, how would one promote this idea? Often times, costs are the bottom line of public projects and the average citizen may not feel obligated to sacrifice for his or her peers. In Los Angles, we have an ever growing problem of sidewalk disrepair simply because neither the state nor the inhabitants want to pick up the tab. I took special interest in this topic. 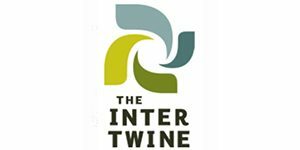 I think the idea itself is fantastic, and while some comments have added that they are unsure of how practical it would actually be, just the fact that we can even think of ways to thoroughly use these spaces in effective and sociable ways is proof that the community is always moving and changing; thats inspiring enough. In California we have even more of an opportunity and to think of the things we could create in our Micro Urban spaces is encouraging. The overall concept of small-scale urban spaces is a great idea, but I don’t really see much practicality of them. When done properly, they do provide green spaces that both enhance the biodiversity of the area, and increase the overall health of the people (through roof top gardens, and connecting multiple spaces together for easier accessibility). A major concern that could arise is that, what if roof top gardens are not open to the public, what if the green spaces created, are done so in a way that deters people from using the space, and lastly, would these green spaces be regulated (if so, how often and for how long) or left unattended to grow naturally. This all would depend on the social environment of each city; if individuals would be willing to collectively work together towards these small-scale urban spaces, or if only a select few would contribute. Micro Urban spaces are a brilliant design concept for increasing social interaction and biodiversity. Especially if these spaces are created by the people living in this area. Allowing people to partake in the design of these areas will increase the care put into these communities. One thing to consider is the maintenance that the city or the people will need to provide in the upkeep of these spaces. But in general keeping in mind the advances in social interaction and biodiversity I believe this is a great idea and should be pushed further. The idea of the meta-city and the micro-urban are certainly interesting and this whole article could be used to change the face of many cities, especially ones with so many unused spaces such as New York City. But I find it hard to imagine making a green roof in the city, as was suggested and not letting people interact with it. There are ways to design spaces that are ecologically important and significant but also allow for humans to interact with the space. This way they can learn in these spaces, and grow to appreciate nature. These little spaces can be a great way for people to interact with each other and for people to become passionate about where they live. Passionate enough to fight for change, or to keep important parts of the city the same.